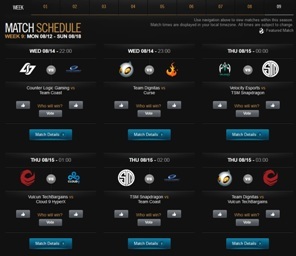 The LCS Super Week (Week 9) starts this Wednesday (08-14-2013) and holds a total of 40 matches from the North American and European esports pro league until its end on Saturday. For some of the teams these final games are the last chance to get necessary points to secure a place in the playoffs. Only the top 6 esports teams will get there. The teams ending the summer split in the 8th and 7th place will have to fight for their remain in the LCS at the spring 2014 promotion tournament against Challenger teams, hungry to set their foot into the world of professional gaming. Moreover the Top 3 teams of the playoffs of each the European and the North American LCS will be granted a slot in the League of Legends World Championship 2013 where they will face teams from all around the world and fight for 1 Million Dollar Prize Pool for the winner. 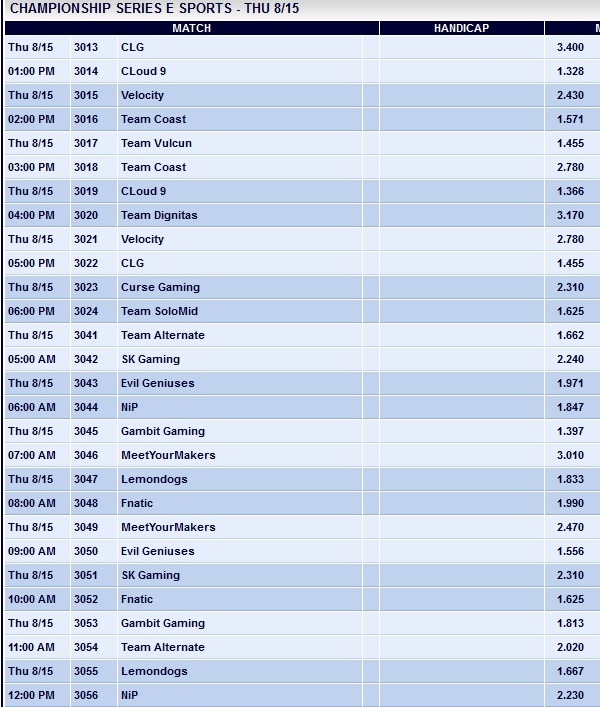 Pinnacle esports offers League of Legends bets for all of the 40 games in the LCS Super Week of the summer split. We have stated you the odds as per Tuesday. If you want to know more about the bookie pinnacle or betting on esports please take a look at our esports bookies section. The odds are subject to change as people are placing bets on the matches – you can find the current odds if you follow the link between the pictures. The longest odd (3,53 at the moment) is available for a victory of Velocity Esports vs. Team Solomid. Velocity is on the bottom of the ranks with only 5 wins out of 23 games. They need to win every single of the 5 matches in the LCS super week to remain a chance for place 6 which would get them a spot in the playoffs. We will see if Velocity can pull that stunt off! 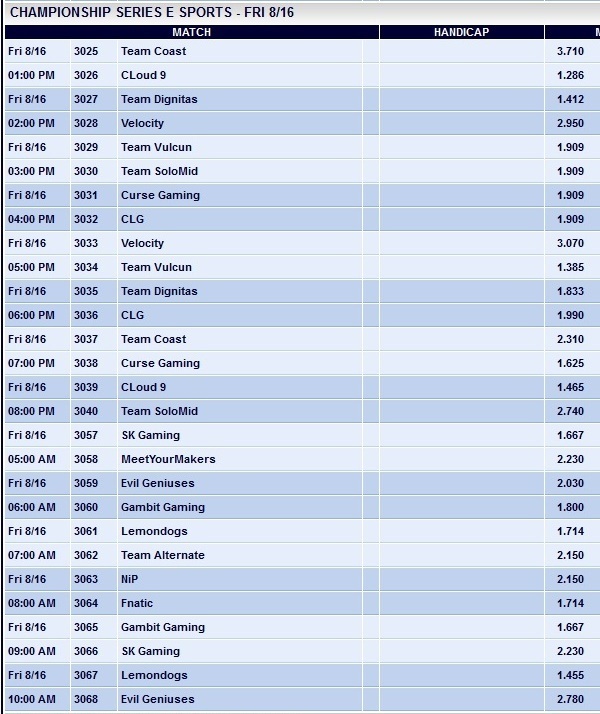 The battle between Team Coast and Cloud 9 offers the longest odd in the LCS Games on Friday and Saturday. At the moment bookie Pinnacle offers 3,71 for a win for Team Coast. No big wonder because Cloud 9 only lost two of the 23 games in the LCS summer split. 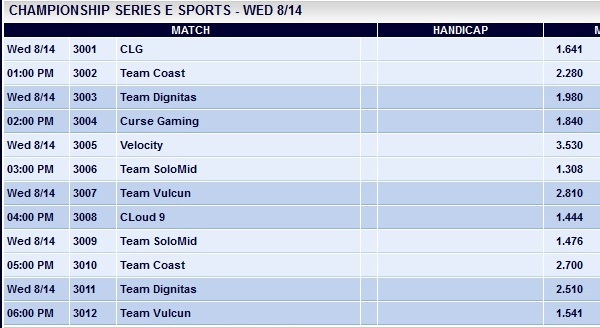 (See below for standings) -> More about esports betting. All games will be broadcast live with moderation. Bets are offered for all games of the Super Week Tournament! 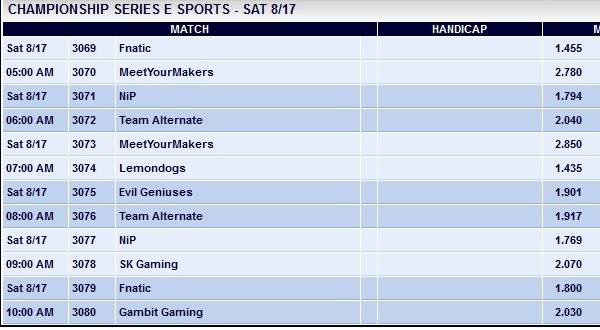 To get a better overview of the games, we provide you a summary of the tables before Super Week. The top six teams from each of the two leagues qualify for the playoffs. The Top 3 teams while fight for their region in the League of Legends Champion Ship 2013 in the USA for first place prize money of 1.000.000 Dollars. You can watch all of the games of the super week here or at the site of one of the various live stream providers like youtube, twitch or on the official LCS website. *.) The odds may have changed in the meantime! No guarantee!